I was really curious about this movie. Not that I expected anything spectacular. But the photos with this cult figure, which popped up on the internet, were rather intriguing. Not really scary but mysterious. A faceless figure with disproportionate limbs who appears in the background while observing children playing. A kind of Pied Piper of Hamelin who lures innocent children and makes them disappear. The fact this creation is the result of an internet competition is widely known. I was only curious if this figure would convince in a horror film. Well, it’s not really innovative. You’ll see the same clichés again. And the same stupidities and bad decisions are made by those who are about to become a victim. And the same tricks out of “Horror for dummies” are applied. And yet, I didn’t think it was bad. “Slender man” certainly isn’t such a big fiasco as you might think. It isn’t as disastrous as the comments you can read here and there on the internet. It won’t go down in history as one of the most frightening or bloody horrors of all time. And the obscure and dark images creates an appropriate atmosphere but also ensure that you can’t see a damn thing most of the time. But I felt that constant threat and the fear among the four teenage girls. And no, I won’t have panic attacks immediately when hearing the sound of crackling wood. But these sound effects did create a creepy mood. Normally I am such a person who whines about the fact that too little background information is given in a film. You are kept in the dark (appropriate for this movies) in terms of the origin and arising of the particular creepy phenomenon. With “Slender Man“, however, I didn’t think this was necessary. It made Slender Man even more mysterious. Summoning malicious demons also isn’t exactly something new. Only recently you could see in “Pyewacket” how a frustrated teenage girl evoked something similar with the help of an occult ritual. And a long time ago, a group of young adults played a tape in “The Evil Dead” which caused Kandarian spirits to ruin everything. In “Slender Man” the cause of all the misery is a video on YouTube. Maybe that fits with today’s time, but perhaps this bothered me the most. They tried to make it too hip. Especially when afterwards this ancient legend also knows about mobile phone technology. They say it might be dangerous. Oh hell, what the heck. Maybe that’s the problem with this movie. They focused more on the continuation of the internet hype and tried to make a modern horror out of it. They lost sight of the concept of a well-thought-out horror. Maybe it fits perfectly with the life the four teenage girls Wren (Joey King), Hallie (Julia Goldani Telles), Chloe (Jaz Sinclair) and Katie (Annalize Basso) lead. A group of carefree teenagers who gained a certain popularity status at school (as seen in so many other Highschool films) and show an everyday affinity with current modern technology. They have more affection for their smartphone than for their fellow students. Yes, they display a kind of arrogance. To such an extent that they simply ignore the warnings for watching the video. Until one of them suddenly disappears and they realize that they might be stalked by this lugubrious figure. Javier Botet. I love this creepy looking actor. Want to know my conclusion in the end? 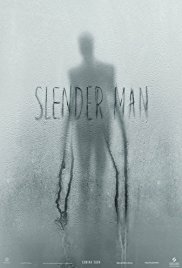 The whole legend created around this Slender Man was much more interesting than the film itself. All in all, it wasn’t original and I didn’t see anything baffling new in this film. But I still found certain scenes successful. Such as the one in the library with the use of a sort of psychedelic footage. And throughout the film, there are more of those hallucinatory passages. Also, I didn’t think the acting was that awful. Ok, sometimes the four girls acted rather childish during meaningless conversations. And yes, some of their decisions were downright stupid. But that suited these young girls. And finally, I also thought the appearance of the mysterious Slender Man was reasonably successful. He blended perfectly with the background so you had this feeling that he could appear at any time. It’s Javier Botet again who has put his peculiar physique at the service to play this nasty character. Just like he did in “Mama“, “Don’t knock twice” and “Mara“. No, “Slender Man” wasn’t disastrous, but seasoned horror fanatics will look at it in a rather condescending way. Beginners, on the other hand, might be afraid this faceless figure will show up. After all, they’ve seen a large part of the illustrious video. Not?